One of the most unique reading experiences for me in a long time was Gemma Files' "Book of Tongues." (I recommend reading that one before reading this review.) The book was not without its flaws, but I'd take flawed and interesting over perfect and safe any day of the week, believe me. Not surprising then that I dived straight into its sequel, and book two of Hexslinger trilogy, "Rope of Thorns" as soon as it arrived at my doorstep. As always with a sequel I began with a small amount of trepidition. Would this book be as good as the first one? All too often it seems that the answer to that question turns out to be no. But not this time my friends. Not this time! I loved "Rope of Thorns." It was everything "Book of Tongues" didn't quite manage to be, and all of the faults (all of them!) that I found with the Hexslinger Trilogy's first book had been addressed. Despite having a lot less narrator time this go around, the character of Ed Morrow finally became real to me. There's a genuine goodness in Ed that's lacking from the other men in these books, but for all that he's just as capable as Chess or Rook as committing acts of great violence. It was a contrast I found fascinating. Instead of Ed most of this book was told from the point of view of Mister Chess Partager himself. I didn't reread "Book of Tongues" before starting this one (way too eager!) but I'm fairly sure there wasn't any Chess point of views in it. He's an enigmatic figure in many ways, and when I realised I was seeing things through his eyes I was concerned that it would "ruin" the mystery of him. Not so! If anything the greater insight into the workings of Chess's, uh, shall we say unique? mind only made him more interesting to me. And more sympathetic, by a mile! Ah, poor Chess. Rook's monstrous betrayal has changed him, that's for sure. And you have to feel for the guy. There's one scene where he has to stay in disguise while a song is sung about how every bad thing Rook ever did is pretty much all Chess' fault, and I don't remember the last time I felt so keenly for a character. I kept oscilating between wanting Chess and Rook to somehow work things out, and and wanting Chess to just blow Rook's smug head clean off. Or maybe some combination of both? We have some new characters this time around, the most noteworthy of this being Experiance "Yancy" Kloves, who neatly takes care of complaints that these books lack women. Yancy is a capable, practical young woman, but she manages to be so while staying true to the time period, in my opinion. There was a dry humour to her point of view that really appealed to me, and I enjoyed watching Chess try and figure out exactly what to do with her. Personally my biggest issue with "Book of Tongues" was that the plot tended to jump around a bit haphazardly. But in "Rope of Thorns" things are pretty much linear. There's an interlude set in Rook's newly founded Hex city (very interesting. It was satisfying watching him realise the enormity of his mistakes, and I'll be very interested to see how things in Hex City play out in the next book) but other than that we stick with Chess and his entourage, without even any flashbacks. 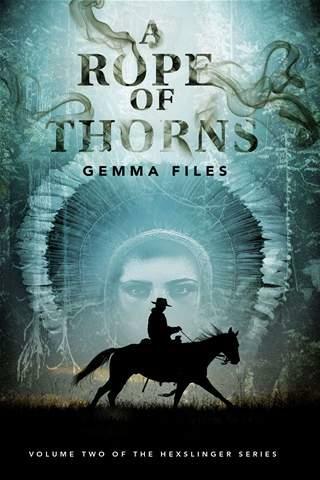 Really "Rope of Thorns" is everything you hope for in a sequel, but so rarely get. The plot is advanced, a greater understanding of characters is granted, new and interesting characters are introduced. Files' prose remains a delight to read, the cadence of her sentences captures the wild west setting perfectly, and the images she paints are a fascinating mix of frontier practicality and magic bred surrealism. Role on "Tree of Bones."